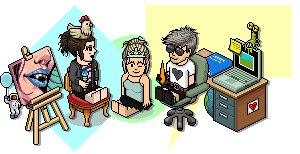 What are your favourite Habbo moments? My favourite non-personal moment was when Callie was Hotel Manager and we had those massive anti-Callie protests where we'd flood the public rooms and I remember everyone would run from the Theatredrome into the Hallways when the HOBBAs turned up! Good times. Twice rebuilding my account to be even better than it was after getting hacked. Getting accepted/welcomed to a number of Habbo initiatives. Meeting a lot of good people and just having a lot of fun. Winning Ludus' Habbo rugby when it was 7 vs 1. I was on a clone account so I looked incredibly nooby so he said if "BashfulRomance (my account at the time) wins, she can have a Dino." (Dinos were worth 2T 38HC at the time, and Thrones were 90HC each). I remember winning and getting so my friend requests! Then got warned I'll probably get hacked by someone because of it so I deleted everyone and traded it over to my main account. I remember going in a Habbox event and I asked the host if I could trade Alex3213 a second to show him it . Having my two friends give me the #18 Executive Drinks Drinks Cabinet Limited Edition Rare for my 18th birthday (because I could legally drink then). I had to promise I'd never sell it and I haven't, can't believe that was nearly 7 years ago now. Finally getting my Streets of Bobba Guitar after searching for years for one. Someone kept putting it in the Market Place and reduced it by 100c every day, I got it for an ok price, and I think my sale was the last known trade of it. There's only 4 known units, and I think mine's the only active one. Last edited by Samantha; 08-02-2019 at 02:43 AM. Way, way back in 2002 or 2003 I went to one of then-hotel manager ione's Q&A sessions in her room. I got the chance to actually ask her a question. Seems lame now but as a 11/ 12 year old I was so pumped by that. In my later years on Habbo I spent a lot of my time working on a Habbo furniture museum. One of the Museum rooms was "liked by staff", which I was pretty buzzing about. Getting into the Habbox eXpert scheme. Helping Sulake with other projects e.g. BETA Tester. Winning a few Habbo comps (room comps, play writer etc). Used to enjoy playing interactive games such as Falling Furni.